Vive Les Gourmands! How Six American Expats In Paris Changed How We Eat : The Salt A new book chronicles the gastronomic adventures of six influential Americans in the City of Lights and what they brought back to the U.S.
Julia Child and her husband Paul at Richard Olney's house in 1973. 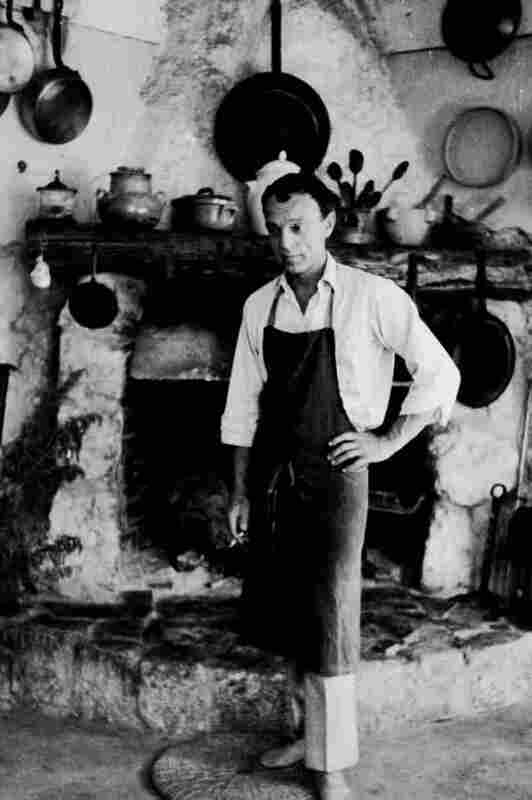 The TV chef played a big role in popularizing French food in the U.S.
Mid-twentieth century Paris evokes images of Left Bank intellectuals earnestly discussing existentialism over demitasses of coffee. But the city was also home to a celebrated food scene that drew gastronomes from around the world. The Gourmands' Way: Six Americans in Paris and the Birth of a New Gastronomy chronicles the Parisian adventures of beloved TV chef Julia Child, New Yorker writer A. J. Liebling, wine merchant and impresario Alexis Lichine, artist and cookbook writer Richard Olney, novelist M.F.K. Fisher, and companion and muse of Gertrude Stein, Alice B. Toklas. This ragtag band of passionate epicureans dove headlong into French culinary culture, reveling in its sumptuous delicacies. They then brought back many of the recipes and ideas about cooking and eating to the U.S. Roast partridge, calf's brains gratin, foie gras rissolettes (small patties), epic multi-course banquets washed down with sundry wines, spirits and liqueurs —The Gourmand's Way bristles with the lavish fare of mid-twentieth century Paris. The Salt spoke with author Justin Spring about the French connection to American food culture today plus the original recipe for hashish fudge. The conversation has been edited for length and clarity. How did this group influence the way we eat, drink, cook and think about food? All six made us feel like something special was going on in France that was worth exploring. Toklas' Alice B. Toklas Cook Book (published in 1954) is more a memoir of her life with Gertrude Stein in the guise of a cookbook, but it had an impact in America because it set the tone for chic French dining at home. 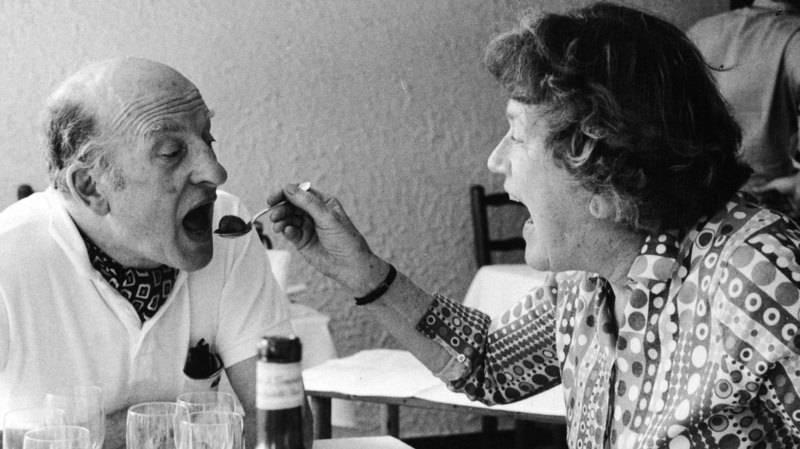 Julia Child forever changed the way we appreciate French food through her sunny upper-class persona. You thought French food had to be special if the rich lady was eating it. Richard Olney unpacked the way the French plan a menu and synchronize not only the dishes but the wines, occasion, time of year and company, to make a meal a work of art. He also gave us a model for eating that's close to the earth and of living simply and beautifully. Alexis Lichine made wine available and comprehensible to Americans. M.F.K. Fisher connected emotions and feelings to food and wine. And A.J. Liebling offered ebullience and joy in his writing about dining in Paris. Fisher's The Gastronomical Me and Liebling's Between Meals: An Appetite for Paris have been reprinted to coincide with publication of this book. These figures were importing French ideas about food and drink at a time when Americans were embracing processed food. Was there tension between these movements? Processed foods began appearing in the 1920s, but they proliferated after World War II — dried eggs, dried milk and other foodstuffs that had been used to feed the troops. There was great excitement about their convenience. There also wasn't a widespread notion that this space-age food, with its sodium or preservatives, might be bad for you. I write about the clash of old and new in the collaboration between Alice Toklas and Poppy Cannon (author of The Can-Opener Cookbook), an unapologetic believer in convenience cooking. Americans still live with this paradox; sometimes you want to reach a box down off the shelf to put something on the table quickly. How did one of the 20th century's most revered cookbooks, The Alice B. Toklas Cook Book, come to introduce the world to hashish fudge? Toklas put in a section entitled 'Recipes from Friends,' and one of those friends was an artist – Brion Gysin, then living in North Africa, where he helped run a restaurant. He wrote Toklas a note with the recipe for a North African sweet, "Haschich (Gysin's chosen spelling) Fudge" — mashed-up dried fruit with nuts and cannabis (despite the name, the recipe calls for cannabis rather than hashish) rolled with butter. [It was a] tasty morsel to accompany your mint tea that supposedly brings on gales of laughter. Toklas, in a rush, typed up the note verbatim from Gysin, slipped it into the manuscript and sent that off to the publisher without realizing cannabis, or hashish, was a controlled substance, much vilified in America. The book went to press in the U.K. and America. The U.K. first edition (now a collector's item) had the recipe; the U.S. publisher caught and excised it. But it was already in the papers that there was a hashish fudge recipe in The Alice B. Toklas Cook Book. This, combined with the facts that Toklas and Gertrude Stein had been barely beneath-the-radar lesbians and that Toklas was now living in the bohemian enclave of Paris's Left Bank, made people excited about this forbidden thing in a cookbook. You describe so many wickedly delicious dishes in the book. Do you have a favorite French meal? It's a little like naming your favorite pet and I wouldn't want to have to cook some of the things I've enjoyed. But I remember a little restaurant in the Loire where I had a pigeon that had been roasted in a casserole with plums. It was so simple. And the combination of lavender, honey, thyme and plums was just magical. You're a dedicated home cook yourself; author of The Itty-Bitty Kitchen Handbook. What did you learn about food and cooking from your research for the book? The biggest revelation from the year I spent in France researching the book was how adept the French, particularly Parisians, are at conjuring miracles from the tiniest of spaces and simplest of ingredients. They can blow you away with something produced from a tiny toaster oven and sink the size of a shoebox. It's about cooking as an improvisational practice. You don't need an enormous kitchen. All that's required is the desire to put a really good meal on the table — that, a hotplate and a dream, plus a grounding in the basics of cooking. From there, it's just a question of spirit.